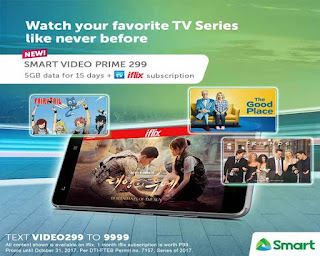 You can now watch your favorite iFlix movies and iWant TV episodes with Smart Video Prime promo package. For only 299 pesos you can get 5GB of data for 15 days to stream video content with two of the known sites or apps. You’ll also get 30 days subscription to iFlix and iWant TV when you subscribe to this offer. If you’re asking how much data is needed to watch a movie or episodes on the mentioned streaming apps, for standard definition you’ll get almost a gig with up to 2-hour movie. That is just an estimate, still your actual consumption may vary on how you use it. You are given a voucher code once you subscribe to this promo and you need to use your Smart mobile number to create an account with the respective streaming app. For iWant TV you need to enter the PIN or voucher code by going to menu then redeem. iFlix users can start using the app by entering the code at the menu then redeem voucher option. You can add more data once you fully consume the allotted bandwidth for Video Prime 299 by texting VIDEO30 for additional 500MB or you can continue watching videos using any of the Smart Gigasurf Promo. Only subscribers with active Video Prime promo subscription can avail the 30 pesos for 500MB booster and also it does not change or extend the validity when you add up Video Prime 30. Do note that you need to download the iflix and the iWant TV app before you can use this promo as this offer does not include internet access to your app store.